There are a lot of things in languages that you are familiar with; it’s just that you don’t know how familiar you are. One example of this is the Rule of Ablaut Reduplication. In linguistics, Reduplication is a change in part of a word so that it will have a different meaning. In some instances, the word could have a changed consonant or vowel, as a result of reduplication. One story that gives an example of this rule in action involves J.R.R. Tolkien. 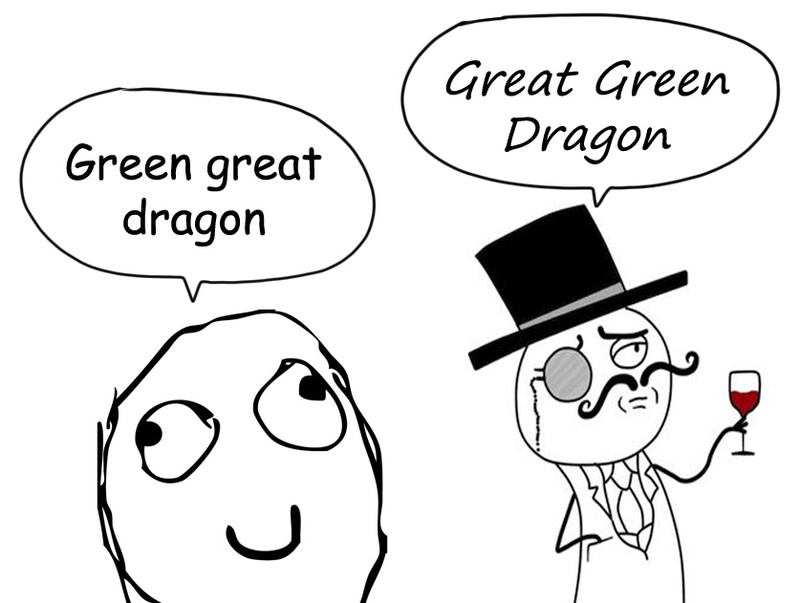 One day, he wrote a story about a “green great dragon.” He showed the story to his mother, who told him that it must be a “great green dragon” instead. Tolkien’s mistake was caused by him being unfamiliar with the Rule of Ablaut Reduplication. Some examples of Reduplication are “tick-tock” and “pitter-patter.” You would never describe a clock as going “tock-tick” or the rain as going “patter-pitter” on the roof. According to this rule, if you have two words, the first vowel must be I, and the second vowel has to be either an A or an O. If you have three words, the order of the vowels has to have this order: I, A, and O. Hence, “big bad wolf” is technically breaking one aspect of this rule (putting size before opinion) while following another. What makes the rule even more fascinating is that native English speakers follow the rule without realizing they are following it. This is because we are so used to hearing language being used a certain way that we rarely ever question it. Most native English speakers subconsciously know how adjectives are supposed to be ordered, and they would probably know if something sounds off, but the vast majority of us probably couldn’t write that order down. In one sense, this rule is a rule, since it is something that most speakers subconsciously follow. But on the other hand, it’s not a rule, since most of us aren’t even aware that this is something we use, and it’s also something that’s not regularly taught to us. This is what makes linguistics a special subject. It enlightens you about something that you didn’t know you knew. It gives us a chance to truly understand language in depth, which is so interesting because language is something that all of us use. The Costs of Being a Woman in the U.S.